Samuel E. Moore & Co.
P. R. Fell & Co. There were many direct importers and dealers in French porcelain, English earthenware, and common crockery in New Orleans. Some of the earliest shops on Canal Street were dedicated to ceramics, serving as agents for English potteries. Similar businesses in the French Quarter imported fine French porcelain to the Creole city. 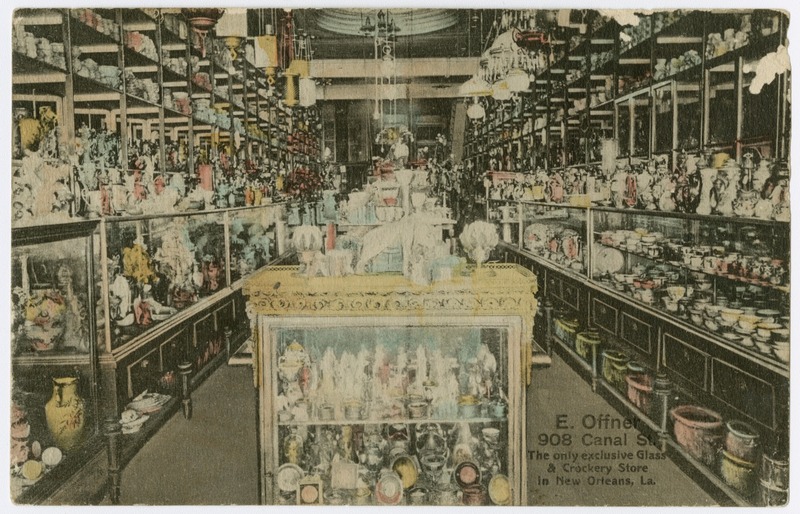 As mass production increased the output of potteries in Staffordshire and Limoges through the nineteenth century, retailers in New Orleans were able to offer a wider variety of goods to their customers. They posted advertisements that listed tea sets, dinner services, chamber pots, and other household furnishings in fancy and plain ceramics, all available at low prices.